Featured Length Instructional Video: Putting Zone Coach Geoff Mangum teaches Steve Elkington all the science and brain function behind "the Reality of Putting". [THEME MUSIC] - So here's what we dealt with on the main [INAUDIBLE]. We taught you how to find out where they are on the green. How do they read the green? That was number one. Where are we? Where are we on the green? And what are we looking for? Then we-- then we talked about the orientation of where your ball is the green, so you know where you are and what you're up against as far as the slope. - Ballpark. Get them in the game to where they've 90% beat everyone else. Then we talked about holing speed. What do we expect for the ball speed-wise where it makes the hole [INAUDIBLE]. Then we talked about how you do that, right? - Delivering-- delivering the goods. - How do you deliver the goods you get there? Then we talked about how what's the best set up to get yourself into position to deliver that ball in that position. Then we talked about how you pick a putter and what's the difference between putters and weight. - You talked loft and lie stuff. - --how you make a ball roll. - How you make a ball roll. And what's the myth? What's true, and what's not true? What would be-- what have we heard, and what have we been told? And what's actually the math of it? What's actually the facts? - Because we can all deal with things that are the facts. 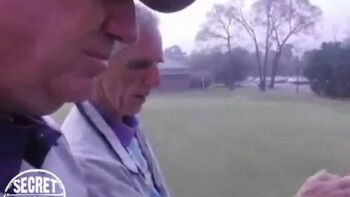 - We were talking-- we were talking about how the swaying of the putter straight and true down the line for a little space is not that complicated and doesn't involve a whole lot about the path [INAUDIBLE]. It involves the body management specifically. - Left hip and the upper neck. - So that's-- that was-- that was our day. And we put all that together on one tape. And I just think for me, it's something that I'm going to have a look at all the time. I mean, I learned two or three things today. We went back, as you know, for a couple hours after that. And I said Geoff, I want to work on a couple of things in that tape that I saw today that I-- I wasn't doing in my game. - And-- and that-- that's helped me some more. So I just think this is a tape that's going to be for every man and woman to look at to be able to have as a baseline and say, you know what? These are the facts. - We're here today with Geoff Mangum, the great-- a great friend and putting coach from the Putting Zone. And our goal today is to present all the facts that Mangum has studied over the years. And we found one another. I found Mangum on YouTube watching his videos. And I've had so much success with what he's taught me this year on the tour that there was just-- I had to-- I had to do a video. What's the first thing we need to know? - Yeah. Well, the fall line is the direction that a marble would roll down a hill. - --and we cut a hole in the middle of a ping pong table. And just the mathematics of that is at 6 o'clock would be a straight-- straight 6 o'clock. And 12 o'clock's dead straight. Anyway Anything to the side at 5 o'clock, by math, has to-- has to curve in. The 4 o'clock has to curve a little bit more. And the 3 o'clock has to curve the most. - Right. And the down hill putt from 2:00 and 1:00, they curve also. - And we'll do, and we'll show a diagram of this. But in this case, we find-- I find-- that if we can find the fall line first, we're-- we're in good shape. - Now, there's about-- there's about three or four rules that we can use, mechanical rules, to find them. - Four perceptions are what is the highest point on the rim, the highest elevation? Which blade of grass is higher than all the rest? [INAUDIBLE] That would tell you the fall line. GEOFF MANGUM: Which-- which would leak out first, right? - --what place will it leak out first? And what will it-- how will it stream straight down the [INAUDIBLE], down the hill? That will show you the fall line. Two other ways are to think that you're going to do a push up on a beach. So you put your hands where they are a level elevation. And this would be wrong. 'Cause this is too low. And that push up would be hard to do. And this would be wrong, because that hand would be too low. So your whole body senses where you could do the laziest push up. So this doesn't feel right. But this feels right. And then my spine is the ball line. So that's the third one. The fourth way-- the fourth way is to imagine a rope tied to the center of the hole. And you walk around it. It's exactly the same distance in the circle. - Like-- like-- like this, right? Like this. - Yeah, right. And so when your feet change direction and you feel that, the first step downhill is going to be where you crossed the ball line. So I'm going to walk out this distance away from the hole. - Uphill all the way, right? - Paying attention to my feet, and I just took a step, first step down hill right there. So you can feel that. You can feel that sense. And that puts you right on the ball line as well. - So you're saying that if you're on a-- you're saying if you're on a green, you could just be walking around. And you start feeling going down, then you'll know that you just crossed the ball line? GEOFF MANGUM: As soon as you feel coming down, you just crossed it. That's right. As soon as you first step down. STEVE ELKINGTON: Well, that's-- that's a cool way to do it. - Yeah. As long as you don't walk in somebody's line. - We got just a regular pie tee. And you don't need to have one of these. But we're just going to show it to you. Fit it over the hole. And we're gonna put this marble on there, roll it around like a game of roulette. And it's going to go to the lowest point. Gravity is going to put it in only one place. Oh, yeah. GEOFF MANGUM: OK. So this is the fall line according to this little roulette wheel. - We know right off the bat that we're in the ball game right here for a dead straight putt just from the mathematics of this. Uh, we know that from right here, it's going to be a pretty straight putt. Is that right, Geoff? - Everything to this side of it, we'll have a draw. This will have a little bit of draw. This one will have a little bit more. And then the 3 o'clock will have the most amount. And then it'll be less again, less even still. And then it will be the 12 o'clock, which will be straight again. Then on this side of the ledger, very small amount of fade, a slice putt, a little bit more, the most, a little bit less, less again, and then back to straight again. Every putt up and down this fall line on from either side of the whole is straight. - Assuming that the green is truly flat. - And not got a hump in it or something. - So we'll prove that just right off the bat to make sure that we hit our marble and cake-- our cake. Oh, [INAUDIBLE]. - Shaded off a little to the right. We can move the stick to make it even straighter. - Just a little bit, right? - Move the stick the same direction that it broke at the end. - That's pretty darn straight, isn't it? Yeah. - Geoff, let me ask you this. So if-- if-- if I came up onto the green and I found the-- the fall line right here and I knew that was the lowest point and my ball was right on that and I read straight, I-- I just putt straight. - That's all there is. - That's the mathematics of it, right? - Aim straight, putt straight, absolutely. - That's the physics and the math. 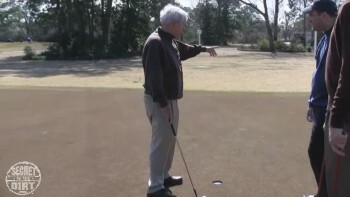 - So is that also a good tip for guys when they go to the practice tee or the practice green? They find a-- they find the fall. Because I know myself on tour. I go out onto a putting green, I find a fall line. And I get myself out here at five feet. I know it's a straight putt mathematically. And then I check my stroke and see if I can actually hit it straight. - --or straight down hill. - --if we came up here, like to a guy hitting about a 3 footer, right off the bat, find the fall line. - See if you can putt it exactly where you aim. 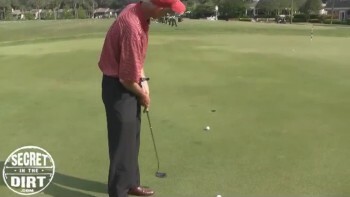 - See if you can putt it straight in the hole up the fall line. - That's a good starting point. - Absolutely. Pre-round warm up. Find a straight up hill putt. Test your stroke. - So our-- our ball's finished here, which we know now from what you said before, that, uh, we know this putt's gonna hook. - We know what the clock looks like. - This is the second hand. And that's the hour hand. - We know. We call them the 6:00, 12:00. STEVE ELKINGTON: We're now over here at, say, 4:00, right? - I'm calling this the hour hand on the clock. - This is the minute. STEVE ELKINGTON: We're over here at 4 o'clock. STEVE ELKINGTON: So we know-- so what you're saying mathematically, it has to go right to left. GEOFF MANGUM: You have to go that way, and then break this way. STEVE ELKINGTON: Yup. OK. So-- exactly. So let's get another line. We're gonna talk about what you'd call the baseline. - To the center of the hole. - It's very easy to know what it is. I'm gonna start the baseline not in the center of the hole, but slightly to the low side on the edge. STEVE ELKINGTON: Why do you do that? 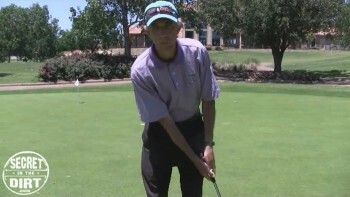 GEOFF MANGUM: Just because you're going to putt. You don't want [INAUDIBLE]. STEVE ELKINGTON: Because you have the whole hole. STEVE ELKINGTON: Is that right? - Right. You could do it in the center, but it's just more convenient to do this. OK. So right here is the bottom of the ball. So that's where the baseline ends up. - That's the baseline. OK. So that's the red and white for the ball line, and just the red for the baseline. - --in real time. But you've sort of graft off just a very small piece that we're putting on. - Right. You cannot use any part of the green other than between the ball and the hole on this piece of pie. This piece of pie, you can't get off and make the putt. [INAUDIBLE] tail on [INAUDIBLE]. - Unless it's some kind of weird break that you don't actually ever see very often. - --this is where our ball ended up. And keeping the fall line in mind and using the baseline as a mental image, you're playing like pool, right? - Like corner pocket deal. - So you call this-- do you call this a visual? What is it? - No, it's more than visual. Because it's ballpark. And then it becomes-- it becomes physical. - So what do you mean-- what do you mean by that? Because, I mean, a lot of golfers are-- are confused when they get on the green. - This is not confusing to me. - I know that the math of it tells me, as you say, I'm in the ballpark of a draw path. - High [INAUDIBLE], keeping high and coming in. - So I'm already sort of eliminated a lot of golfer's worries and fears about where they are. - Because I play in pro-ams all the time. I'd say this putt right to left, uh, you know, half a cup. And they go, boy, really, you know, I really didn't-- I really don't see that. - But here, it's very obvious, right? - Absolutely. All right, here's the first way. The first way is what would happen if you imagine putting dead straight down the baseline, the red line? Start it that way. [INAUDIBLE]. - It would look-- it would look to me like the ball would probably come over here somewhere. OK.
- But your brain's ability to predict exactly the blade of grass that it rolls over is very good. - For that area, right? - We predict a very specific grass blade, how low it will go. That's physics. - Because I-- I don't want to bang into the string, I'm just going to cut it parallel, right? - So we'd put that up here, right? - Same amount from the center of the hole up hill. - So the first way to do it is to predict how low it will go. - So you're saying if I putt and it goes-- I putt along this baseline, it goes low. STEVE ELKINGTON: I take that distance, I put it up top. - Up hill [INAUDIBLE] here. - All right, let's try that. - The thing about the putt is the only part of it that really matters is the last part where it goes in the hole. You've got to get this part imagined correctly. - I [INAUDIBLE] to imagine this. STEVE ELKINGTON: Yeah. Now, you have to imagine this. - You sort of look up here. And you say, well, if it's going to go in on this hole, it's got to come in across sort of this-- this area. GEOFF MANGUM: Yeah. You-- you predict that with your brain. And you're very good at predicting that. I have a little car to show you how to start line, the aim line of the putter has to coincide with what you visualize, like a race track. - [INAUDIBLE] into the hole. STEVE ELKINGTON: Just like that. STEVE ELKINGTON: It's got to go in there. STEVE ELKINGTON: All the way back. - --all the way back to the hole-- to the ball, I'm sorry. STEVE ELKINGTON: You're saying, visually, you could just do that. - --shine straight over here. And guess what? Same target. STEVE ELKINGTON: Same target, yeah. Let's move that car, Geoff. I'll see-- see if it'll just go right down that, where you were there. - So do you do that with you brain? - Imagination. Everybody's imagination is a practical testing in advance of what's gonna happen in the future. We just did that. - So does it become-- do I become better at my imagination if I know where these things are? - Because if you're out here in the Never-Neverland, I got-- I turn around here, and I'm one a hole. I've got no lines to help me. - But all of a sudden, I look over to that hole. And now, I noticed that I could pitch it at the fall line over there. And my baseline's here. And I've got to go in that way. - I've already have some imagery here. GEOFF MANGUM: So if you figure out how high to go, you're done. The third way is to feel the putt. STEVE ELKINGTON: Feel the putt. STEVE ELKINGTON: What does that mean? - That means that when you're dealing with the baseline and the fall line, there are two things that you can't do. You can't go low. - And you can't cram the putt to fast. There's magical way to do this. STEVE ELKINGTON: As in like-- as in like Vegas? - As in like-- as in like very spectacularly workable. - The correct angle start line. - Not that angle-- too high. Not that angel-- too low. But what's in between is just right Goldilocks. The way you find that is that if you're too low, you have to hit it faster to keep it above the baseline. - The ground changes is what you're saying. - You brain will know if you [INAUDIBLE]? - The fastness-- no. The fastness goes away. And once the need to hit to fast to keep it above the baseline totally evaporates, you're good to go. Stop going high. - What do you say to people that, uh, they say, well, you know, I just really never had-- I've never really had good touch. - You haven't had it explained to you the way you already have it normally every single day of you're life. - Like when they do any-- anything. - Yeah. You open a door, you always get your hand on the doorknob. You never miss. - You reach for a glass of water, you don't swat it across the table onto the floor. - So you're saying that the average person doesn't have to have any more than that? - They have to know how to deal with the space. - So once they deal with the space, they're good to go. Normal people. - If I go here on the low, it won't do it. - Right. That's dealing with the space. - It's gonna do it right there. - Good. You're good. That's normal. Normal people have that. - It told me. My brain told me that-- when to stop, when it evaporated as he said. I felt like I-- I wasn't going to go left. - Right. So that's aim high enough. - What we want to talk about right here is the first video that I saw Geoff on YouTube, which peaked my interest, was about holing speed. If you're the player, what does the player need to know about the actual gravity? Because there's a lot of-- there's a lot of myths out in the-- there that you've got to be a certain speed to hole a putt, and so and so on. - But that's not exactly scientific. There is some science behind the weight of the ball as it passes over an open space. - Right. Gravity always takes the ball exactly the same way. - This ball will take a certain amount of time to go down. This one will take exactly the same. They hit the ground exactly the same speed, the same time, everything. - Never changes. This high, that line. For a ball to actually go in a hole and stay there, when it crosses, gravity has to get permission to start acting, which it does as soon as it gets across the front lip. - The ground gets out of the way. Gravity takes over. Now, how long does it take the ball to sink one half of its diameter before it gets to the back wall? If it doesn't sink that much or more, it's gonna pop out. GEOFF MANGUM: It's gonna get too high. So it's all about how much time do you have for the ball to sink at least one half of its diameter. STEVE ELKINGTON: That's what will keep it in? GEOFF MANGUM: That'll keep it in. So you want to give it that much or more time. - And that's-- that's not necessarily the best rate. - That's just- that's just the maximum threshold. - That's right. You got to start as it's the fastest possible putt, and work backwards. - All right, so this is how long you got to give it. - It won't stay in. - It'll look like this. Boop. Boop. Not going in. - The brain already knows the first time it'll go in, it'll plug right here in the dirt, because it sank [INAUDIBLE]. So if I want to make a putt that will stick in the dirt, that'll be the slowest. That'll be the first time that I backed down slow enough. - OK? Now, the brain knows a lot about all this. Because it watches all day. And it knows that if you go any faster than that, it's not going to sink. - Now, that's two factors at once that give it enough time. - How long of a path did you take? - Center cut path across the hole is this long, 4 and 1/4 inches. If you don't-- if you go center cut, then you can-- you can put the speed to it. - OK. If you miss that cut, it won't go in anyway. - The speed that you can put to it is enough that will stick it in the-- in the dirt. But if you go any faster than that, even center cuts get fast. - All right, so you slow down. Do the first one that goes into the dirt. That'll give you a center cut putt. But golfers are not good enough for center putt. They need to be able to use these outside shorter paths. This is an maximum path. And these out here are shorter paths. - You want a lot shorter path. - I want to-- I want to use the whole amount. How fast does my ball need to be going to get the maximum amount of sync? - And use-- to make the hole the biggest you can make it by, that's what you call, math. - Wouldn't that be the smartest golfer? - Well, that's right. The golfer is choosing smart delivery speeds based on real physics that you can't do anything about. - Right. So here's the choices. There are three factors that you have to sort out to make your smart pitch. One is you don't leave it short. - --to make it to the front. - The second factor is what path will actually allow it to sink enough to stay in the hole? - Like a curve putt. - Short putt, short path. So what speed will give you the widest hole? The third factor is if you miss, you don't want to have a three putt or a comeback. You want to be in something that's in the gimme range. - So let me show you the gimme range. Every time a golf ball rolls, it goes approximately one hand span. If you unwound the golf ball, it's 5 and 1/4 inches or so. - One roll, two rolls, three rolls past the hole. You're still gimme inside the [INAUDIBLE]. Four rolls past the hole is in trouble. And five rolls past the hole, you're looking at maybe a three putt. So the brain knows that any speed that will stay within the gimme range is acceptable. - For this part of it. - It's still in the hole, hole dropping zone. - OK. There is a factor. This is a factor that's very important. That holing speed of this is important. - And you will make more-- more putts if you-- if you adhere to the rules of this. If you get the correct speed all the time, you will hole more putts than a guy that hits it too hard. - Oh, absolutely. And you won't three putt. - OK. So how do you-- how do you teach me how to-- like, how do you teach a person to get good touch? Or how do you get a person to teach me to deliver it on time? - --show me right here. - We showed us the space already. - --past that. Now, the brain says, OK, that's a wall. - Here's the wall. Don't do that. - Do this instead. OK.
- So I created a space. And then I say, OK, you just do your thing. - And that's what the brain's built for. - Absolutely. Does it all the time. - OK. Great. Get the space first. Let's show us how we can implement that into a putting stroke. - All right OK. Here's the [INAUDIBLE] Now, we want to get into what the brain is here, right? - Yeah. The brain says make the space definite. And then do your thing with the rhythm. Make the space definite. Do your thing with the rhythm, not short, not long. - You're saying anyone can do that? - Anybody does it all day. - You just have to create what you're saying is the space. And know-- and know don't go past that. - Yeah. Here's the problem with golf. - And that would be in what you said earlier about, like, banging your head against the doorknob. - Right. You won't go long. - You won't go long, is that what you're saying? - Yeah. You won't. Your brain will protect you. - All right, now, there's a thing you need to know about golf. First it's a game, so there's no real pain and injury. You have to self-motivate, create that by setting standards and expectations. You do not accept going long, because that's just not professional. You're better than that. - All right, the second thing about golf is that greens don't have walls on them. You have to make them yourself with your mind. - Just like you do a baseline and a fall line. - Right. See, I look at a green, and it looks like a prairie to me with a few gopher holes on it. - I don't have any walls to worry about. But if I mentally make the wall, that makes my brain automatically good. All I do is just go ahead and deal with the space. - I'm not going to bang it into that. I'm not going to bang it into that. - And what's the key to that? The tempo? - The key is the rhythm. - All right, rhythm is the way the body delivers the goods once you define the space and what you expect to happen. - So is this sort of-- are we getting into the-- what you call the holy grail of the speed? - This is what you call the holy grail. - I'll look. I'll make the intentionality to the space. And then I'll make a rhythm. I'm good. In the ball game. Not any short, not any long. I'll make a rhythm. And I'll tell you what exactly is the rhythm. But a rhythm is what delivers the body's goods for distance control. Rhythm is what the brain already knows more than anything else for movement. Same way, same why, all day. That's rhythm. - What do you mean same way, same way? - Rhythm is the quality of this way to that way. And tempo is how fast you do that or how quickly you do that. We're not talking about tempo. We're talking about rhythm. - All right, so the brain is like this. The brain is rhythm all the time. - So equal on both sides? - Equal, equal. This way, that way, no different. All right, so you're always like this. And nothing is force or size or impact velocity until you look at a target for the space. - Don't speed it up or slow it down. - Wait till the space gives it to you. - Yeah, let me show you this little all purpose swing. This doesn't go anywhere in particular. But when I look at the hole, it'll change size. Now, it's to the same. It changes size. If I just let the ball get in the way, not short, not long. - Then it's the same, same. - I'm not-- I'm not ask-- I'm not asking it to do anything yet. - So now, I'm going to turn around. - It's your tempo and rhythm. - I'm going to turn around. And it's going to tell me-- OK.
- That's right. Now, when it changes that's not you picking in your mind. That's your body choosing. - Your body's already hard-wired to pick it. - Yeah. So now, I've got the putt that everybody hates, all right? Down hill, left to right up. - Well, let me show you what's safe about the down hill left to righter and rhythm. - OK. That's the first thing. - So I'm doing a little-- a little deal here. - OK. Now, all right what you'll find out is that you're off the hook. - You're absolutely excused. Because the brain will not go along. It will protect you And the rhythm will get it all the way there without going long either. - OK. And in this case, I used exactly the same, same, same. But it was a much shorter beat. GEOFF MANGUM: You changed the tempo. Now, you're going to the next level, which is this [INAUDIBLE] tempo. STEVE ELKINGTON: I changed-- I changed the beat. GEOFF MANGUM: Right. Change the speed or the quickness of your stroke all you want, but don't mess with the rhythm. They get nervous right here. And they say, I'm going to do a little quicker, more controlled stroke. But I'm afraid it's going to knock it way off. - Answer is, no, it won't. - They won't if you've already picked the sight. - Right. OK. So I go faster, faster, faster, But I go same, same. I'm safe. - I make myself safe by, first, the intentionality of do not allow that. And then whatever I did, I re-do. What is safe is that if you do that, you're safe to do it again. STEVE ELKINGTON: OK. OK. So if you do, whether it's a short-- same, same or same, same, if you-- if your brain says same, same, and that's safe, you just reproduce it. And your brain knows it, loves it. Is that what you're saying? - Yeah, and you're off the hook. STEVE ELKINGTON: And you're off the hook. - Because you can go anywhere for the short putts. And you say, how do you do that for distance? You'd say, define the space, make the rhythm. - All right. And I'm right here. GEOFF MANGUM: Now, you just deliver it with the rhythm. That's it right there. And your body gives it you the back stroke. GEOFF MANGUM: Your brain gives you the energy going forward. - Or something like that. GEOFF MANGUM: No big deal. - --not accelerate and all that when I could have just used my rhythm. - Simple rhythm. Your rhythm is never wrong. So long as you define find the space, don't worry about it. If you move your hip, your shoulders, and your hips, you can do them separately. Or you can do them together. So that's three combinations. Only one of them-- one of those just absolutely never happens. The one that never happens is hips only move rotationally, and shoulders don't go with them. Nobody does that. - So the two that are real are hips and shoulders together like this. And then the other one is shoulders only, hips stay home, like this. Leave the hips alone in the back stroke. And what does that do for you? It creates a Hansel and Gretel situation, where this is the home, this is the breadcrumb, and this is Hansel and Gretel. When they go away, the tension in the body is the breadcrumb that brings you back to the home that didn't go with you. It stayed there. - Yeah. That's-- that will bring you home from a back stroke when in comes to the inside. You don't really have to worry about the backstroke. - So let's-- let's show us here. Let's see a couple balls. - Sure. My hip is getting good and same distance. The hip didn't do that. STEVE ELKINGTON: Didn't do that. - The hip stayed there while the shoulders came inside. Then this is the breadcrumb. STEVE ELKINGTON: The from means something you left. - Well, the tension in the body only develops when you twist. - --the top over the bottom. STEVE ELKINGTON: It'll pull you back. - Right now, it's neutral. And there's no tensions. Now there's tension. Because I made this stay home. - That tension disappears when I'm square. So that's our body's [INAUDIBLE]. STEVE ELKINGTON: It brings you back. - The body know exactly when you're square, as long as you've left this home. - So I'm going to leave the hip home. I'm gonna go inside a little bit, then I'm home again. Nice square putt. I'm not gonna get the neck swing too much like that. I'm gonna control that a little bit. Hip stays home. Shoulders and neck go a little that way. That's OK. But once I come home, the door shuts. Stay there, then the putter goes where it wants. If I go through the door and break the door shut through the door, that's a pull. - So I don't want to pull. I want to swing away up the wall. All right, so leave the hip. Do not go the neck line further than square. Avoid that. So set the hip. Stop the neck, it goes straight. - I've got the rhythm. - Now, you got the ball mechanics and the rhythm. And they were working together on the same page. You just do a little thing with your hip and your neck, you're good. [INAUDIBLE] 1,000 [INAUDIBLE], never anything different. - I get my rhythm, one. That's the length. - Come in, touch down. - Top of your body and your hip. Boom, there you go. Putter swings exactly where it wants to go. You-- you don't have any issues. So you're dealing with this and with the left hip. And then the rhythm just delivers the goods right square through the bottom. Right. Now, you know biomechanically where the bottom is. It's basically straight down below your neck, the base of your neck. So you're set up to the ball with the top of the neck, and then you putt the bottom. Don't worry about putting. OK. That was [INAUDIBLE] very stroke. The rhythm was not really paying off at the bottom the way it should. OK. This is two swings, one back, and one through. Good. Perfect. STEVE ELKINGTON: How do you choose which one's the best for you? STEVE ELKINGTON: The weight, the way you've always told me about the way the weight feels anyway and you swing it back. - I think there's, uh, you want simple visual appearance, so that your brain is not wondering what it's looking at. You want a square simple line. You want a good line this way. This is what you aim with, not something pointing this way. This is what you square up, this stretch. So this little thickness right here is a really good feature of a putter. So you don't-- they-- they tried to fake it on this one. - But then they've got all this other distracting stuff on here. - So you want something nice on the top about-- that's about a quarter of an inch thick. That's a good thing to aim. Second, you want good heft, overall heaviness. STEVE ELKINGTON: Weight. For you, right? STEVE ELKINGTON: The way it feels to you. - For you personally based on your strengths and your body size-- not too big, not too little, Goldilocks for you. So you have-- you have a thick, thick muscular arms, heavier than me. But I don't know about your sensitivity and your grip. Some guys are big armed with a very fine sense of the pan. Third thing you want is a good grip that fits in your hand nicely. Now, different people are a little different about this. Some people like a pencil thin grip. And some people like a very fat grip. Some people like a spongy grip. STEVE ELKINGTON: So it doesn't really matter, right? - It's kind of personal. 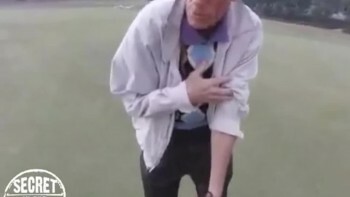 But you-- you also want to watch out that your putting style-- if you have a solid grip form that doesn't change, you don't really want a grip that's too thing. Because it might-- it might have little holes popping open in your stroke in the middle of the swing. So you want something that's going to be amply full. Now, the other issue is I feel good and balanced. But maybe my arms up here like that. Um, some people teach that you need to have your arm up in the air. But most people do best when they hang their arms naturally. [INAUDIBLE] The reason for that is that this is natural, neutral, relaxed gravity. And when you swing, you want gravity as your friend. Gravity is your friend for stroke path when your arms are hanging naturally. A lot of players, a lot of golfers, will have this altitude kind of bobbing up and down. I feel like I set this-- it's like I had a golf ball setting onto a plank on a-- on a book shelf. And then I roll underneath that at that altitude. This is not allowed to change, the height if your neck. That way when you hanging your arms, this-- this sets very good biomechanics by poising this down a plank, and then rolling-- rolling underneath that. OK. So you're-- basically, you set this. Hands, you hang. And then when you get this set and you're hanging, you take the play out, there's a bottom that's not going to get any longer. So you just stay there. STEVE ELKINGTON: Stay there. OK. So what I've learned from that is a couple things. There's a lot of choices. - But there's a couple of-- you've given us a couple of tools to figure out what's the length of the putter. - As long as you squeeze it sufficiently to blend the tool into your body, [INAUDIBLE]. - Yeah, [INAUDIBLE]. It's flat steel, it doesn't make any difference. - That's right. This is how a ball is shaped. You see the equator right here. At the equator, this quarter constitutes the tangent plane on this surface. The tangent plane is different depending on where it is. - On the equator, that is 0 degree loft. - The only way you can touch that spot on the equator with the putter is to make sure that the putter at impact has only 0 degrees loft. STEVE ELKINGTON: 0, right, yeah. STEVE ELKINGTON: Just below it. - --whatever is 3 degrees down. - So if I tilt this 3 degrees down from the center, 3 degrees down, that's like right there. So I can only touch that putter below the equator when I have positive loft. STEVE ELKINGTON: That's just straight math. - Right Now, there's three ways to hit through this ball-- up, straight, straight through the equator, and down. - If I'm going to hit down, I have to have a negative lofted putter, or else I'm not going to do that. I can sort of swipe up. STEVE ELKINGTON: --could be down. But it's actually not happening. - It's not really happening unless you have negative loft. - You cannot touch that up there, unless you have negative loft to match it. You don't have to worry about it, so long as your putter is adding loft through impact. Because ball and putter come together, remain together, and then come apart. STEVE ELKINGTON: It's a very short time. STEVE ELKINGTON: But in physics, it's measurable. - It's absolutely significant in physics. - -- like a kid on ice. STEVE ELKINGTON: And drive it. - -- it will punch it into the ground. STEVE ELKINGTON: That's no good. - The ground is springy. It will go into the ground. And it'll just kind of bounce back out. STEVE ELKINGTON: Lose velocity, and et cetera. - Right. Right. So none of those are really what you do when you roll a ball. What you roll a ball is you start, and then you get more. And you actually don't knuckleball through it. You roll the top over the bottom. You can do that hitting below it, because every time you touch a ball, you started right to the center. That's what the quarter shows you. There isn't any way to touch a ball without aiming through the center. And that's all knuckleball. But you don't stay there. You start it, and then you add a little bit. And you roll the top over the bottom. Everybody talks about true roll. - But they don't really know what the real thing to look at in true roll is. It's not how fast did you get this turning over. It's did you launch it off the ground? That's the bad part. STEVE ELKINGTON: That's the bad part? STEVE ELKINGTON: You want to just even it. - Absolutely. You want to-- you want to nice leave the ball along its way, so that it doesn't hop into the air. STEVE ELKINGTON: So there isn't too much friction. - Actual or feels like? - And it's-- it's-- it's-- you can-- you have to know how little it takes. That looked like I was driving it straight, but I'm not. - You entered just under 3:00. - You'd come through in over here up at 10:00 somewhere? - Well, you actually- you start one dimple below. And it aims to the exact center of the ball. And then as the ball moves that way and your putter increases loft, the force and the blow aims not through the center anymore, but above the Center. - So the actual blow is going to go as if it goes in one dimple low of the equator and comes out one dimple high of the equator. GEOFF MANGUM: You poke it out the front. STEVE ELKINGTON: Hit a little high, than center. GEOFF MANGUM: That's right, with the rhythm. Boop. There you go. So there's-- there's a geometry that everybody needs to understand for what rolls the ball. 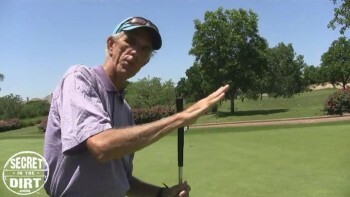 The geometry is how big is the circle of the full putting stroke if you went all the way around. All right, so from here to there is 4 and 1/2 feet for me. And if I go all the way around, it goes 9 feet out. So we make a giant hoola hoop out of plastic and set it on the ground. It's 108 inches from side to side, 54 each way. 54 from here to there, 54 from here to there. And if you set that on the ground, it makes a very interesting shape on the bottom. STEVE ELKINGTON: Touches the ground quite a bit. STEVE ELKINGTON: It just clears. - It just clears the golf ball. OK, you can see that's 13 inches, because this is a 10, so there's about 13. - All right? Same thing that way. Now, that's not the part that you actually worry about, because the impact area is right here. STEVE ELKINGTON: 4 inches or so. - Here's the center. And you're only worried about that much. How much does the putter bottom, sole of the putter rise off the ground over that span under the [INAUDIBLE]? 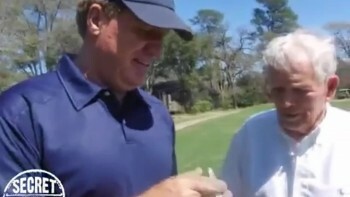 STEVE ELKINGTON: You're gonna put a quarter down and tell me. - Here's a quarter, and here's a nickel. I will never touch the quarter. But I can possibly get the nickel off. So it rises as much as a quarter. On the putter face, if I kept it dead level to the ground all the way through, I would hit it there only. But if I play the ball 3 inches ahead and let it arc up, now I show you exactly how much it will rise. It will rise from there to one quarter's width lower to there. STEVE ELKINGTON: It's not much, is it? GEOFF MANGUM: No. It doesn't make any difference. You don't need to worry about it. GEOFF MANGUM: Ball position's not that big of a deal. STEVE ELKINGTON: --if you adhere to this. - Right. All right, so I'm going to show you how ball position doesn't affect straightness. The stroke affects straightness. There's the bottom. And I'm going to put the ball there. And we know that the putter would rise the quarter, but wouldn't rise the nickel. STEVE ELKINGTON: So you're saying you don't have to be as perfect. GEOFF MANGUM: No. You don't have to worry about ball position. GEOFF MANGUM: You have to worry about your stroke. STEVE ELKINGTON: That'll guarantee a little loft. - Now, we're talking about how to roll the ball again. If you stay here as the bottom, you will add loft according to the shape of the big circle. And that will not do anything other than roll the ball. So you don't have to worry about it. That ball is not going to come off the ground. It's not going to launch into the air. It's going to true roll just fine. And everything that people do to tell you you need a special putter and you need a special technique is just not really true. 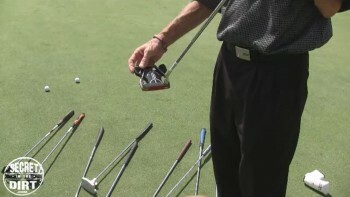 You just need to let the putter rise slightly through impact, so it doesn't send the ball off the ground into the air. - [INAUDIBLE] right. Maybe right here. 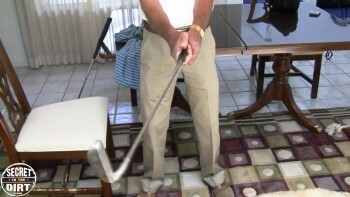 So the first and best way is to know your stroke well enough that you can aim your stroke action. - Right, so I have the stroke action like this. And I can aim it, because I know where it's gonna go. And I'm gonna make an analogy with a gun. A rifle has a little sighting tip at the end of it. And I know that that sighting tip points at that grass blade right now. And then my action is it points like a machine gun to these grass blades in a straight line. - So I know where my stroke is going to go. STEVE ELKINGTON: You aim your action. - I aim my action, because I've-- I've carried this around like a gun. - Most people will aim their bodies and then they just plop their head down. - Aim with their eyes, and all that kind of stuff. - Aim with your eyes. - Yeah. You need to aim with your shot. - This is my-- this is my action right here. STEVE ELKINGTON: And if it just keeps going infinity, all I'd have to do is literally walk in. GEOFF MANGUM: Right. And take it easy with the rim, and get it with the nice [INAUDIBLE]. Right. - That would aim it. GEOFF MANGUM: Bang, bang, bang, bang, bang, bang, bang, bang, bang. GEOFF MANGUM: That last-- last one is I'll look right across that [INAUDIBLE], and I'm looking at the right edge. Bang. - You're saying I could be over here somewhere. GEOFF MANGUM: Yeah, whatever. That's your action. - Now, when you plant that foot, all the joints line up. And you're ready to rock. - Just aim the body [INAUDIBLE] shot. - I just aimed it. - Now, do what you aimed, or else you're gonna scrape. [INAUDIBLE] you gonna change to plan B right in the middle of the situation. - There you go. That's it. Aiming is-- is-- everybody's all visual and optical and all that stuff about aiming. The brain science is not visual. It's you aim your body's physical action. - The visual stuff in brain science is there are two systems of vision. The one for action and where things are in space is extremely stick figures, black and white, and simplistic. It's not anything like optometrists think it is. It's connect dots, so here or there. I don't care if it's a Titleist ball. It could be a [INAUDIBLE]. You don't care if it's this kind of putter. You don't care what color things are. - This is what your brain's saying. - Your brain is black and white, stick figures, connect the dots, space, here, there, with your action. So your action's here. And that left foot plants. Here goes there. And then you put the rhythm on it, and you're good. STEVE ELKINGTON: Sort of like that. - This is if you're not a natural aimer with the shot. This is how you grind when you aim to the side whether you like the aim of the putter face. We're not actually trying to match the putter face to a target over there. We're past that. Now, we're trying to judge whether we did a good job. So we want to find the skill that says, wherever it aimed, I can tell you 20 or 30 feet that way what blade of grass it hits. That skill requires that you do one special thing with your eyes. You look here, and you see that. And then when you roll your face, the laser beam of your eye sight makes a dead straight line sideways that matches the putter face. If you can do that, you can-- you can call whatever it hits over there. - All right, so now how do you do that? Because golfers don't seem to know that. So there's a [INAUDIBLE]. That's not what the eyes do, though. The eyes are down the face, something like that. - OK. That's the eyes. So you put your eye ball over the ball. And you say, I'm good. - What happens when you rotate your head is that it aims to the inside way over there. STEVE ELKINGTON: Aim your face at the line. - Aim your face. Even though you're not over the ball-- even though you're not over the ball, if you aim your face, it will go straight down the line forever. OK? You shoot arrows. So you need to know if I shot you in the back of the head, how does the arrow [INAUDIBLE]? - But if I turn my head now, I'm-- I'm actually tracing that all the way. - Yeah, you face the putter with that arrow sticking through your head. It sticks out here. if you don't get this arrow point in between you and the ball, you haven't faced it. All right, now, the thing that everybody gets confused about is the posture that it takes for you to face a ball makes them feel uncomfortable when they stroke it. Well, I've got news for everybody. They don't have to stay there. All they have to do is check to see if they like the putter face, and then just leave it alone and reset. - So you could go here and take a look see. - If you like it, take-- take a drink of water, eat a ham sandwich, and then set up again and putt. You need Comfort and balance when you're stroking. But there's no law that says the posture that you have to get in to accurately judge the aim of the putter face is the only posture that you can use when you stroke it. There's no [INAUDIBLE]. - And when you actually turn your head, what are you looking for? You're looking down. - You're looking to the sense of a Ferris wheel delivering two eye balls, one bucket in front of the other, vertically rising straight. - And that'll tell you if-- if you-- if, for example, if I went like that and it's way over there, you'd go, well, that's not right. - Well, you didn't get there. You got there by doing something like that. - No, I'm saying if you looked up, and you didn't like where your Ferris wheel was looking, then you-- you adjust everything, right? - Now-- now you're in shape. - --and you try again, and you hit the hole, you're good to go. - Now, your shot is organized and-- and it aimed. - OK. That's right. Absolutely. - OK. Now, I'm good. - Once the putter quits wiggling and you like what you've got, because you've checked blah, blah, blah, you're home free. 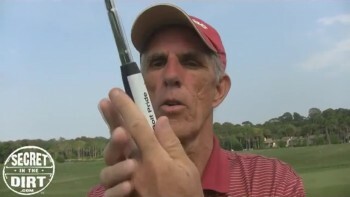 You build your-- your base [INAUDIBLE] to the putter. You putt the bottom with the nice rhythm. The rhythm [INAUDIBLE] worry about. - Now, you build it in. - Once the putter's aimed, you're good to go always, forever. - I get my rhythm. - I'm ready to go. 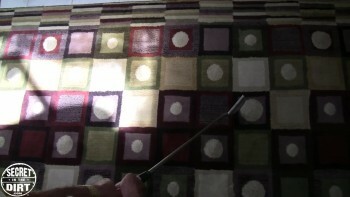 - Well, number one putter for inside of 5 feet and number one for like three putts. And I just-- I putted great this year. I learned so much from Mangum. - He's the guy that's got the size. He's got the pedigree and the research and the hours behind it. - Plus, I can putt better than [INAUDIBLE]. - I winged it. I-- I don't know if I saw that. - It's OK. I'm just teasing. I'm just teasing, just teasing, just teasing.